This entry was posted in rifle, training, weapon and tagged 22LR, AllOutdoor. Bookmark the permalink. So you take a “gas piston” clone of a M-16 and make it a blow back .22 that kinda/ sorta LOOKS almost like an HK gas piston clone of an AR-15? But without the gas system? Man I knew the AR-15 market had glutted with bad M-4 copy’s but this is getting silly. Good thing it has a flash hider, so you don’t blind yourself or give away your position. They could add an M203 analog underneath, chambered in 22CB or CO2-powered 17, or it could throw those little paper-wrapped snap-pop thingies you get with your fireworks for Independence Day. All we need now is a full sized, belt fed, semi auto M2 Browning chambered in 22LR, with the big muzzle break, complete with a standard tripod and spare barrel, you know; for inexpensive practice and general plinking. Taking the theme farther, they could come out with a copy of a modern battle tank, with its main gun chambered in 22 LR, for inexpensive practice also, and plinking around the farm. 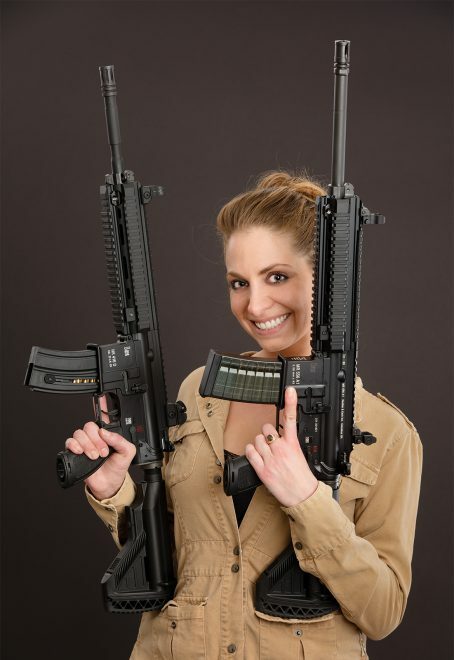 Sorry H&K, but at some point you know you’re asking for it. I’m sure that’s a fine piece, and I wish you well. Somebody made an M1917A1 an M1919 and an M2 miniature in .22 several years ago. They were exact mini reproduction’s at 1/4 scale and fired . They were “stupid money” expensive if I remember correctly. I spent some time but couldn’t find one on the ‘net. Maybe with your “network” you might have better luck. Don’t know about quarter-scale, but these are half-scale in .22. Which makes more sense as a quarter-scale bore for either .30 or .50 would be too small for a .22. LarryA@ These may be what I remembered. I vaguely remembered a wright up I read while I was in cancer clinic. Cool ether way.